I took an old tut I did and revamped it. Open a new image, 600 x 250 and fill with color of choice, I used #7eac7d. Paste your tube and apply Mura Meister-Copies-Wallpaper rotate at default settings. Apply Andrews Filter #44-Fabric Wrap at default settings. Twirl, 50, 10 0, 0, 10, Elliptical checked. Then apply Andrew Filter #44 again, change the blend mode to overlay. Now apply Unplugged Tools-Interlace with these settings, twice. Take your selection tool and draw out a small rectangle about half way across, add a new raster layer and fill with #56944c, Effects, Edge effects, enhance, select none. 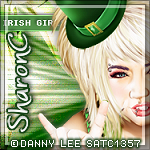 Type out your wording of choice, I typed out Irish Girls Rock, using Oh la la for the wording, set on 10 Pixels and the Bold button pushed in, merge down, duplicate and move one to the left side top and the other to the right side bottom. Paste your full tube and move below the rectangle layer, duplicate and move to the other side, merge these together, change the blend mode to overlay or one you prefer, apply Mura Meister Copies-*Line, with the 1/n Fade out checked. Paste your medium size tube in the center and adjust to your liking. Open a new image 150 x 150 or a size of your choice. Paste your tag and resize to 70% and place how you like it. Apply the AAA Frames-Foto frames with same settings as before. Be sure all copyrights have been added to your tag. Here is the original I did back in Feb 23, 2013 using Danny Lee when he was at Scrap and the City.